[common] Front-panel diagnostic lights on a computer, esp. a dinosaur. Now that dinosaurs are rare, this term usually refers to status lights on a modem, network hub, or the like. This silliness dates back at least as far as 1955 at IBM and had already gone international by the early 1960s, when it was reported at London University's ATLAS computing site. There are several variants of it in circulation, some of which actually do end with the word ‘blinkenlights’. Old-time hackers sometimes get nostalgic for blinkenlights because they were so much more fun to look at than a blank panel. Sadly, very few computers still have them (the three LEDs on a PC keyboard certainly don't count). The obvious reasons (cost of wiring, cost of front-panel cutouts, almost nobody needs or wants to interpret machine-register states on the fly anymore) are only part of the story. Another part of it is that radio-frequency leakage from the lamp wiring was beginning to be a problem as far back as transistor machines. But the most fundamental fact is that there are very few signals slow enough to blink an LED these days! With slow CPUs, you could watch the bus register or instruction counter tick, but even at 33/66/150MHz (let alone gigahertz speeds) it's all a blur. Despite this, a couple of relatively recent computer designs of note have featured programmable blinkenlights that were added just because they looked cool. The Connection Machine, a 65,536-processor parallel computer designed in the mid-1980s, was a black cube with one side covered with a grid of red blinkenlights; the sales demo had them evolving life patterns. A few years later the ill-fated BeBox (a personal computer designed to run the BeOS operating system) featured twin rows of blinkenlights on the case front. When Be, Inc. decided to get out of the hardware business in 1996 and instead ported their OS to the PowerPC and later to the Intel architecture, many users suffered severely from the absence of their beloved blinkenlights. Before long an external version of the blinkenlights driven by a PC serial port became available; there is some sort of plot symmetry in the fact that it was assembled by a German. This newest version partly reflects reports that the word ‘blinkenlights’ is (in 1999) undergoing something of a revival in usage, but applied to networking equipment. The transmit and receive lights on routers, activity lights on switches and hubs, and other network equipment often blink in visually pleasing and seemingly coordinated ways. Although this is different in some ways from register readings, a tall stack of Cisco equipment or a 19-inch rack of ISDN terminals can provoke a similar feeling of hypnotic awe, especially in a darkened network operations center or server room. We are informed that cod-German parodies of this kind were very common in Allied machine shops during and following WWII. 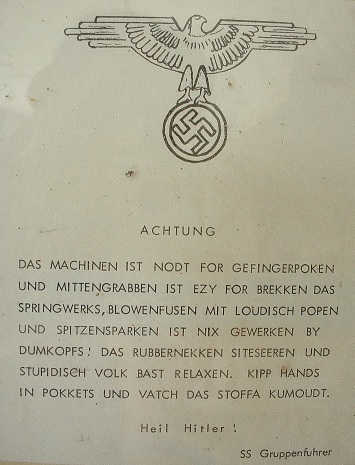 Germans, then as now, had a reputation for being both good with precision machinery and prone to officious notices.